During the award presentation, Leprino Foods announced a donation of 4,300 pounds of mozzarella string cheese to the Food Bank Council of Michigan. The donation is an effort to support the one out of every seven Michigan residents struggling with hunger. MMPA and Leprino Foods began an agreement over 30 years ago that has enabled the success of two Leprino cheese plants in the state of Michigan. The plants in Allendale and Remus process a combined 3.5 million pounds of milk per day and support over 400 jobs. 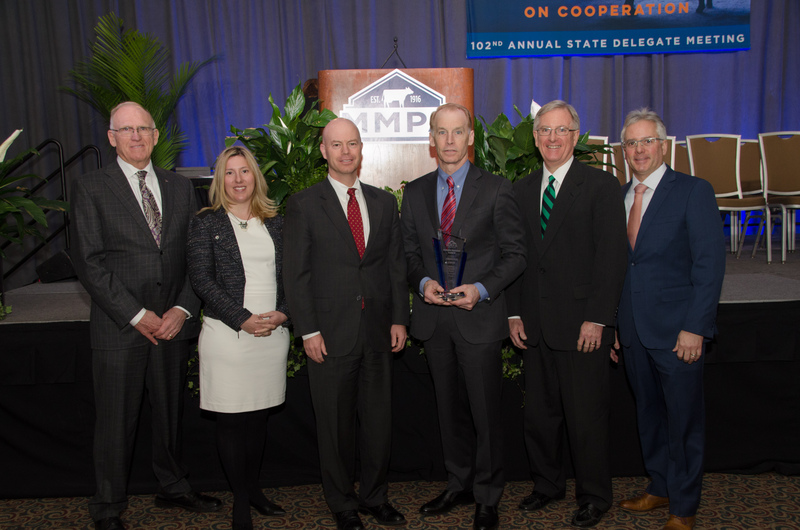 “Through vision, MMPA and Leprino have remained steadfast ‘Partners in Progress’ through the years,” said President Ken Nobis, who presented the award with General Manager Joe Diglio on behalf of the cooperative. The initial partnership, innovative for its time, brought Colorado-based Leprino Foods to Michigan in the late 1980s. Leprino is now the largest manufacturer of mozzarella cheese and supplies many of the world’s leading pizza companies. Per capita consumption of mozzarella cheese has more than doubled in America in the past 30 years. Thanks to the growing dominance of pizza, Americans now eat almost 12 pounds of cheese per year, according to the U.S. Department of Agriculture. Leprino Food’s donated mozzarella cheese—produced locally in Remus, Michigan—will reach food banks in all 83 counties of Michigan after being distributed by the Food Bank Council of Michigan. “We are grateful for our mutually-beneficial relationship with Leprino Foods. Together, our quality milk and Leprino’s innovative technology creates value for the industry and MMPA dairy farmers. Our work with Leprino showcases the lasting power of collaboration,” Diglio added. The announcements were made at MMPA’s 102nd Annual Meeting in Lansing, Michigan. Approximately 400 dairy farmer members and guests gathered at the meeting today to discuss the current dairy industry, recognize members, adopt policy resolutions and elect board members. The Michigan Milk Producers Association (MMPA) is a dairy farmer owned cooperative founded in 1916. MMPA serves approximately 1,700 dairy farmers in Michigan, Indiana, Ohio and Wisconsin, handling approximately 5 billion pounds of milk annually. MMPA operates two SQF Level 3 certified manufacturing plants in Michigan and a cheese plant in Indiana. Products made at MMPA’s plants include butter, non-fat dry milk, whole milk powder, cream and condensed skim milk. Leprino Foods Company, headquartered in Denver, Colo., is a global leader in the production of premium-quality cheese and dairy ingredients. Leprino Foods is the largest producer of mozzarella cheese in the world and a leading manufacturer of lactose, whey protein and sweet whey. For more information, please visit www.leprinofoods.com. MMPA President Ken Nobis (left) and General Manager Joe Diglio (right) presented the Valued Partner award to Leprino Food Company. Accepting the award from Leprino Foods were (center, L-R) Associate Director of Raw Dairy Ingredient Sales Melissa Bischoff, Vice President of Supply Chain Mark Benson, CEO Mike Durkin and Senior Vice President of Corporate Affairs Mike Reidy.